Structural Cross Sections: Analysis and Design provides valuable information on this key subject covering almost all aspects including theoretical formulation, practical analysis and design computations, various considerations and issues related to cross-sectional behavior, and computer applications for determination of cross-sectional response. The presented approach can handle all complex shapes, material behaviors and configurations. The book starts with a clear and rigorous overview of role of cross-sections and their behavior in overall structural design process. Basic aspects of structural mechanics are reviewed and procedures to determine basic cross-sectional properties, stress and strain distributions, stress resultants and other response parameters, are provided. A brief discussion about the role of material behavior in cross-sectional response is also included. The unified and integrated approach to determine axial-flexural capacity of cross-sections is utilized in development of P-M and M-M interaction diagrams of cross-sections of various shapes. The behavior and design of cross-sections subjected to shear and torsion is also included with emphasis on reinforced concrete sections. Several detailed flow charts are included to demonstrate the procedures used in ACI, BS and Euro codes for design of cross-section subjected to shear and torsion, followed by solved examples. The book also presents the discussion about various factors that can lead to ductile response of cross-sections, especially those made of reinforced concrete. The definition and development of action-deformation curves especially moment-curvature (-) curve is discussed extensively. Various factors such as confinement, rebar distribution and axial load effect on the ductility are shown through examples. The use of moment-curvature curve to compute various section response parameters is also explained though equations and examples. Several typical techniques and materials for retrofitting of cross-sections of reinforced concrete beams, columns and slabs etc. are reviewed. A brief discussion of various informative references related to the evaluation and retrofitting of structures is included for practical applications. 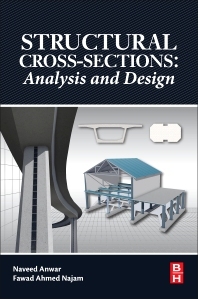 Towards the end, the book provides an overview of various software applications available for cross-section design and analysis. A framework for the development of a general-purpose cross-section analysis software, is presented and various features of few commercially available software packages are compared using some example cross-sections. Provides detailed flowcharts for code-based (ACI, BS and Eurocode) design of reinforced concrete cross-sections subjected to axial-flexural actions as well as shear-torsion. Naveed Anwar is the Executive Director/CEO of AIT Solutions (AITS), Director of Asian Center for Engineering Computations and Software (ACECOMS), and member of the Structural Engineering faculty at the Asian Institute of Technology (AIT), Thailand. He teaches academic courses to Masters and PhD students at AIT, related to modeling, analysis and design of tall buildings and bridge structures. Dr. Anwar received his BSc. degree in Civil Engineering from University of Engineering & Technology, Lahore, Pakistan, in 1982, and both Masters and PhD degrees in Structural Engineering from Asian Institute of Technology (AIT), Bangkok, Thailand in 1986 and 2004, respectively. He was the Managing Director of a civil and structural engineering consulting firm in Pakistan for several years before joining AIT in 1995. Dr. Anwar has an experience of over 35 years in the structural modeling, analysis and design of buildings, project management, design of bridges and other structures, designing hundreds of projects. His specialty is in the performance based design and evaluations of structures, specially tall buildings. He has conducted hundreds of professional training. Workshop and seminars, attended by more than 3500 professionals in more than 15 countries. Topics covered in these events are related to structural analysis, design, dynamic analysis, and nonlinear analysis etc. He is proficient in the development of software for structural engineering applications, including earthquake resistant design, structural detailing etc. and is the author of several software including SDL, SYSDesigner, GEAR, BATS, NichadCAD etc. He has also contributed towards the development of many other programs such as RISA Section, CSI Section Builder and CSICOL. Fawad A. Najam received his BS degree in civil engineering from University of Engineering and Technology (UET, Taxila) Pakistan in 2009, and MS degree in Structural Engineering from National University of Sciences and Technology (NUST), Islamabad, Pakistan in 2011. He has been associated with Department of Structural Engineering at Asian Institute of Technology (AIT) and AIT Solutions (AITS) in Thailand since then and has received PhD in Structural Engineering in 2016. He is also a member of the Structural Engineering faculty at the National University of Sciences and Technology (NUST), Islamabad, Pakistan. His areas of interests include earthquake engineering and structural dynamics, seismic performance evaluation of tall buildings and structural engineering software development. He has participated actively in various private and public sector projects, strengthening the academia-industry linkages in Pakistan while working at National University of Sciences and Technology (NUST). He has an experience of 5 years in academia and civil engineering practice, working at various appointments including lecturer of civil engineering, structural engineering consultant and research associate at various institutes in Pakistan and Thailand.